This document was issued in New Bedford to the ship Marcus, which was under the command of Samuel H. Taylor. The vessel was heading from New Bedford bound for the Pacific Ocean, with provisions and stores with utensils for a whaling voyage. The ship Marcus was home-ported in Sag Harbor, N.Y. and while in the south Pacific was known to have stopped on several occasions at Pitcairn Island, the refuge for the mutineers from HMS Bounty. This sea letter is in four languages: French; Spanish; English; and Dutch. 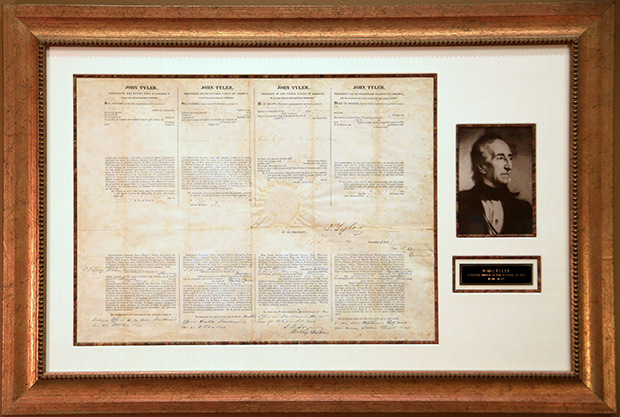 It was signed by President John Tyler who was the first Vice President to succeed to the Presidency after the death of his predecessor, in this case William Henry Harrison, who was only in office from March 4, 1841 until his death due to pneumonia on April 4, 1841. Tyler, in his one term from April 4, 1841 to March 4, 1845, proved himself a strong President. He vetoed bills his Whig supporters wanted when he thought the bills were flawed. Within six months he was expelled from the Whig party and all of his cabinet resigned except Daniel Webster, then Secretary of State. This document was issued after Webster had also resigned and was replaced by Abel P. Upshur. When Upsure died in an accident, John Caldwell Calhoun became Secretary of State and he was a signer of this sea letter. Calhoun was at odds with President Tyler over the issue of slavery in the Texas territory. Tyler wanted Texas annexed, but Calhoun strongly supported slavery in Texas, which Tyler opposed. This brought failure to the annexation bill in congress. Ultimately, Texas was annexed in the last days of Tyler’s Presidency. Another signer was the Collector of Customs, Joseph T. Adams, who managed to secure the appointment through the influence of a New Bedford friend, Josiah Sturgis, a friend of John Tyler’s son. The other signer was J. F. Terry, the Notary in Fairhaven across from New Bedford. Terry notarized testimony concerning the desertion of two members of the crew of the Acushnet, on which Herman Melville was also serving. This sea letter is printed on rag paper and bears the Great Seal of the United States in the center as well as a notary seal on the center left.